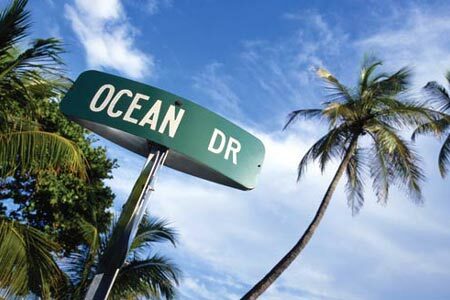 The Flight Deal | American: Seattle – Miami (and Vice Versa). $270. Roundtrip. All in. 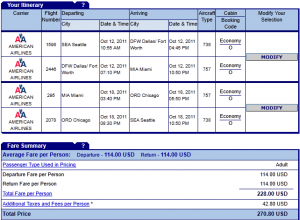 American: Seattle – Miami (and Vice Versa). $270. Roundtrip. All in. A beach fare good until Feb, 2012? Sounds good to us. 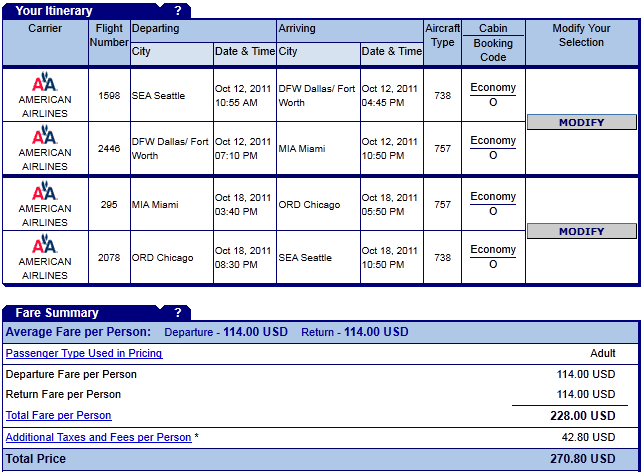 It is rare to see an airline publish a fare at this price to a beach location for the Winter this early in the season. Take advantage now! October 12th – 18th. Valid until Feb 15th, 2012 for Monday through Saturday travel. Blackout dates during Thanksgiving, Christmas and New Years. Must be purchased 7 days prior to travel. Use http://matrix.itasoftware.com and flexible month search to find exact dates. 5,561 miles or 4.8 cents per mile. Bookable on AA.com. AA’s risk free cancellation policy here.